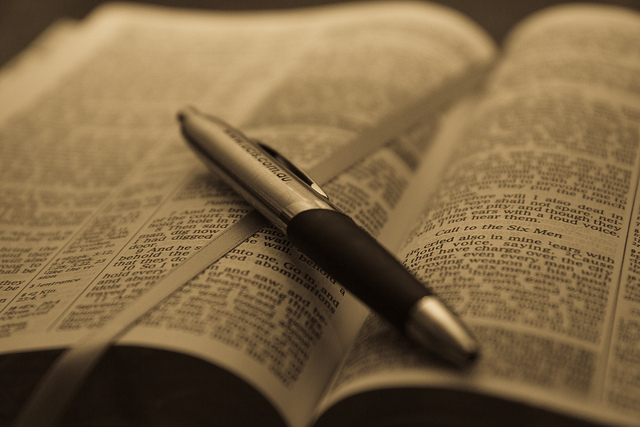 Yesterday, I wrote about how NOT to read your bible. Pulling verses out of context for a quick fix, using devotionals with someone else’s slant on the word, reading me centered instead of He centered. So today, let’s talk about some ways we should read the bible. First, understand when we read the bible it’s to know and love God more. It isn’t to pull a verse out to put on like a Band-Aid, it isn’t to find scripture to go around bible thumping those “in sin”, and it isn’t to fill your head with more knowledge. It should produce a deeper understanding of God, greater love for Him, and lead into worship. If you’re thinking, yeah right! That NEVER happens when I read, then you’re in good company. Secondly, one of the best ways to help grow in the Word is to pick one book or section of scripture and study it. Sit in the passage for a while, reread it, come back to it, look up words, and become familiar with it. Part of the reason I’m not a fan of devotionals is they take you all over the place, pulling a verse here and there out of context, and slapping someone else’s meaning or application on it rather than reading a book in its entirety. 1. Pick one book of the Bible to read for the whole month. Start by reading the entire book, from start to finish. Then slowly go back and read chapter 1. Read chapter 1 a few times before moving on to chapter 2, 3, 4 etc. The more you read the book, the more familiar you’ll be with it and start to memorize where certain things are at in the bible. 2. Don’t just jump to application. Observation: Take note of things you observe in the text. Do you notice any repeating words or phrases? Commands? Promises? Who is the author speaking to? When? Where? Why? Interpretation: What does the text mean? Not what does the text mean to you, what does it mean. There is only one meaning to the text, it can have a personal application for you, but it’s meaning is consistent. Look up the definition to words, cross-references, etc. This is where you can really dig in! Application: How does the text apply to your life? Pray before you read for God to illumine your heart. Pray after you read for what you’ve learned to sink deeply into your heart and mind and change you. He promises, by the power of His Spirit, to do the work! Pick a passage weekly to meditate on and memorize. Find a friend to call and share your verse with. Write it out on a note card, stick it to your bathroom mirror or dashboard. Psalm 119 tells us to hide God’s word in our heart so that we might not sin against him (v.9). Don’t try and do this life alone. We need others to encourage us and spur us on. Again, I hope this blog will be a place we can grow but I encourage you to find a friend, a life group, and a mentor, someone to process what you’re learning with. If you need help getting connected, let me know. I’m on staff at a church to help make this happen!! Really, call me. Okay, let’s give this a try. Have you noticed the past few days, the 3 questions I’ve asked have followed this pattern? I could do the work for you and simply write posts that explain everything. In fact, there are many bible studies out there that do that. However, I think it’s best if we practice this together. Eventually, it will be a benefit as you read the Word on your own if you have these tools in your tool kit. 1. Read John 15:1-11. Write down any observations, repeating words/phrases. 2. What does it mean to abide? Why is this significant? 3. What kind of fruit are you bearing right now? What are some ways you can stay connected to the True Vine to bear good fruit? This is all a warm up for what’s going to happen in August when we go through Philippians. CLICK HERE if you want to sign up for the email list and join us!